A single vehicle accident this morning in Petersburg has left two dead and two injured. The community’s 4th of July parade and carnival has been canceled in response. Dead are 18-year-old Molly Parks and 19-year-old Marie Giesbrecht. Two others in the vehicle were transported to the local hospital for non-life threatening injuries and were reported in good condition as of noon. Their names have not been released. 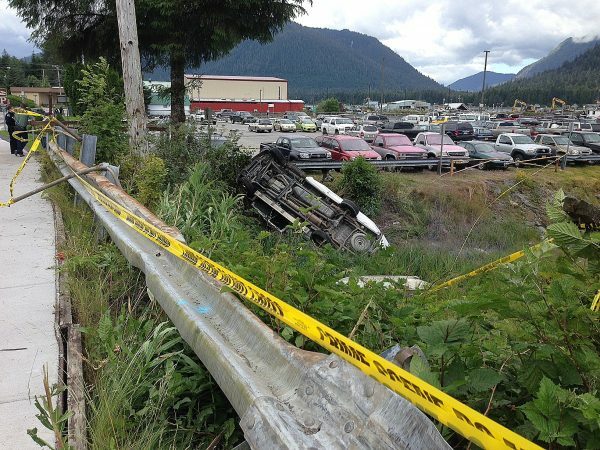 The car turned over into a ditch near the South Harbor parking lot at about 7:30 a.m. Police secured the area and nearby vehicles with yellow ribbon. Officials have not released other details of the accident. Molly Parks graduated from Petersburg High School this year and is the daughter of R.D. and Madonna Parks. Marie Giesbrecht graduated from the local high school in 2015 and is the daughter of Petersburg’s Borough Manager, Steve Giesbrecht and his wife, Mary Rokey. A candlelight vigil will be held tonight at 10 on the main downtown street in front of Wells Fargo Bank. There will be a procession to the ball fields where paper lanterns will be released prior to the regularly scheduled fireworks display at 11. People today are gathering at the Lutheran Church’s Holy Cross House where counselors and teachers are available to talk. Everyone is welcome.